Packet radio has been something I have always wanted to get in to. When I first got licensed, back in the late 90s, we had a fairly active packet scene at the local club (VE1YAR / VE1GX) but I was never able to scrounge up the funds to get into it. At the time, I was a teen, money was scarce and any extra was allocated to other activities. Now that I have gotten back in to the hobby, I’ve taken an interest in it once again. Being a computer guy by trade, it would only be logical that I would want to get in to this mode. And things have worked out better this time. 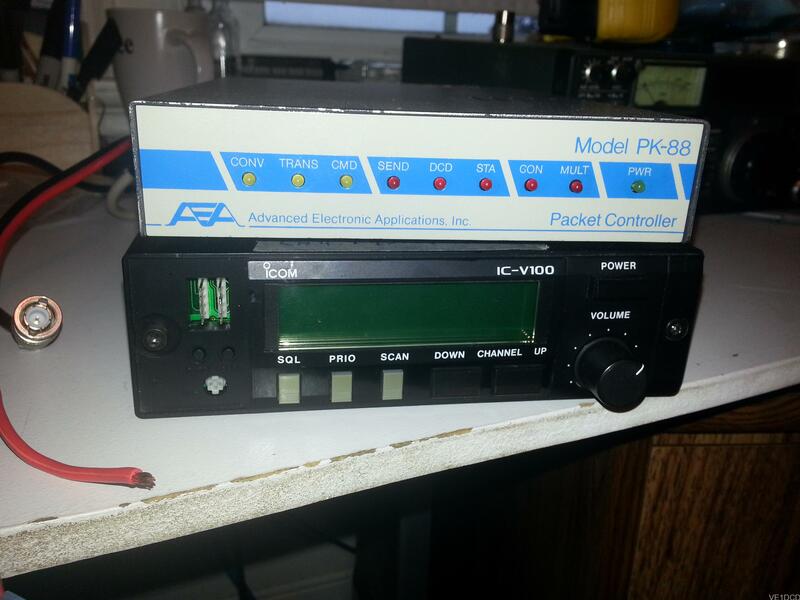 I have now added an AEA PK-88 TNC and an ICOM IC-V100 VHF radio to my shack. This is thanks to a local club member who put the call out for unused TNCs and received about 12 of them. As time permitted, he took them apart, and refurbished them so he could pass them along to local club member who were interested in putting them to use. Along with the packet network we are building up, another local ham has talked about bringing his BBS back on-line. This brings back some very fond memories of my early computing days where I used to be a regular on a couple of local dial-up BBS systems. Both of which happened to be operated by the same person. Even with the Internet and other modern digital communication, I can still see a lot of value in an older system such as packet. With a packet system, one does not have to rely on the copper infrastructure that can be relatively unreliable at times. It is also a great mode for emergency communications if other methods become unavailable due to inclement weather or a disaster. All one needs (aside from the hardware) is power. The station can also be moved to a new location relatively easily should the need arise. Anyway, I think this is going to be a fun little venture. There are only a couple of things left to do to get the station up and running. I will be getting the required serial cable this weekend and then all I have to do is mount an antenna. Then I can start making some packet racket! Hello Dennis, were you able to get all the data connections out of the from mic connector on the V100? I’ve got a few here collecting dust, and it sounds like a good idea. Hi Darcy, I believe that is where the data connections reside. Unfortunately, I was not the one who wired it. When it was passed along to me it was already mated to the TNC. 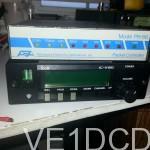 Is there a problem that could petrify my Icom V100. I opened the solder battrey 3Volt inside the unit. Display in the display is changed Pch: cc …. Lock ..